La Villa del Mare is located in the Poetto beach, just 20 mt from its white sand, in an historic building in Liberty style, finely restored and adapted to ensure all modern comforts. La Villa del Mare Suites & Apartaments is located in Poetto beach overlooking the beautiful blue sea of ​​Golfo degli Angeli and close to Sella del Diavolo, a few steps from Molentargius Park, famous for its pink flamingos’ colonies. A meticulous and careful renovation in Liberty style, combined with an elegant soul that complies the charm of the past at the same time, brings the guests of La Villa del Mare to the glories of the classic old fashioned Italy, renewed into a sophisticated modern taste. The Mediterranean style, combined with the refined decorations of contemporary objects, makes the atmosphere looks sober and functional, while keeping an elegant appearance at its best. The rooms have various sizes, suitable for all needs. Some of them have direct access to the garden, other have a large terrace or balcony, overlooking the garden or facing the beautifulsea, all of them have linen (sheets and towels), amenities (soap, shower gel and shampoo), hairdryer, heating & air conditioning, minibar, TV Color LCD, Wi-Fi Internet connection,safe. The bright and spacious apartments are equipped to provide everything needed for a relaxing vacation.The set includes:linen (sheets and towels),amenities (soap, shower gel and shampoo),hairdryer, heating and air conditioning, minibar,TV color LCD and Wi-Fi, safe. In addition, the kitchen is stocked with dishes, pots, glasses, microwave oven, refrigerator and electrickettle. 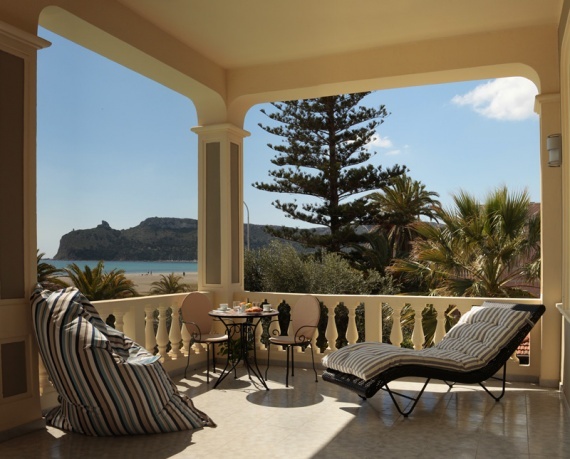 Guests of La Villa del Mare can enjoy a quiet and serene atmosphere and experience the charmof a seaside holiday just a few minutes from the center of the city of Cagliari, the capital city of the sun and the Mediterranean.